Big Baobab, originally uploaded by MBoy68. 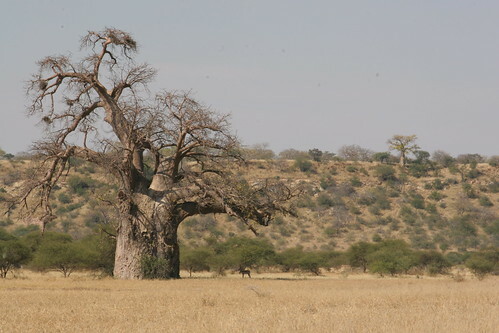 If you have any doubt about the size of this tree look closely at the Impala that is standing in its shade. Baobab trees have very fat trunks because they use them to store large amounts of water. When the rains come the Baobab tree soaks up as much water as it can and stores the water in its trunk which swells to create a huge storage tank. Then as the dry season stretches on the Baobab's trunk slowly shrinks as the water gets used up.